Poulan P4018WT Gas Chainsaw Review - Who Says Yard Work Can’t Be Fun? A few years back I had the chance to go on an all-expenses paid ski adventure and it was arguably one of the most fun trips I’ve ever been on. I’m not a very good skier, but skiing was only half the fun. We also had our own private chalet to stay in and it was heated by a beautiful fireplace and an old-fashioned woodstove in the kitchen. We weren’t in any danger of running out of wood because the owner had left a huge stockpile in an outdoor shed. They were nice big logs and I couldn’t help thinking it must have taken a lot of effort to chop all that firewood – you definitely wouldn’t want to tackle such a task without a chain saw! I thought of that experience the other day as I was continuing my research into the ideal chainsaw that would be both affordable and capable. One saw that I believe would have potentially done quite well making all that firewood is the Poulan P4018WT Wild Thing 18-Inch 40cc 2-Cycle Gas-Powered Easy Start Chain Saw. I realize it’s not really a tangible feature, but I don’t think this review would be complete without paying homage to the marketing appeal of this saw. 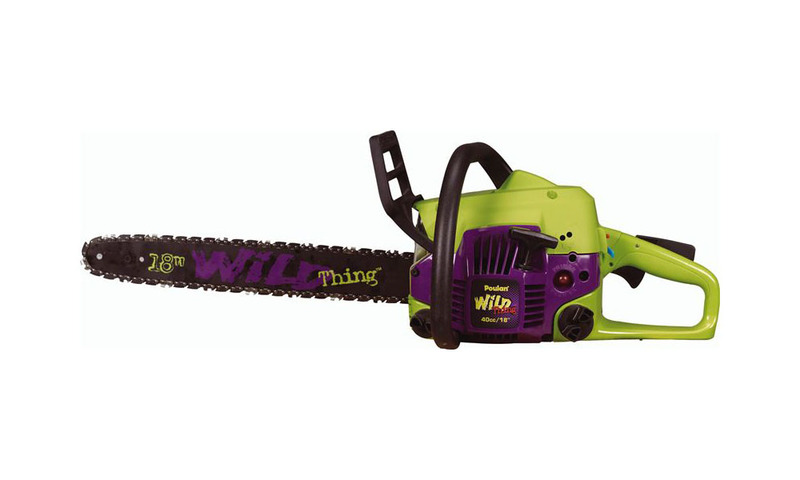 Who wouldn’t be interested in a chainsaw nicknamed the Wild Thing? There’s no doubt that it’s a great name, but you can’t cut wood with a marketing gimmick so this doesn’t really score it a lot of points in the long run. A tangible feature that does score this saw some points is its super clean air filter system. If you’re not sure how important an air filter is for an internal combustion engine, suffice it to say it can extend the life of your engine considerably. An air filter prevents a lot of unwanted particles, such as dirt and bugs, from entering your engine. It’s important to have a properly functioning air filter system, so it’s reassuring that the manufacturer of this chain saw has made it such an important part of the design. A chainsaw that doesn’t have the right amount of oil on the blade can produce a lot of friction, which will eventually affect the proper operation of the device. It will take longer to cut through each piece of wood – that’s if it can cut through the wood at all without getting stuck. It’s common practice for chainsaw manufacturers to include an automatic oiling feature and this machine is no different. It has a gear driven automatic oiler that ensures the blade and chain receive the right amount of oil to keep them functioning at their best. Another popular feature on many chainsaws is the inclusion of a primer bulb and, again, the Poulan P4018WT Wild Thing has one of these as well. This mechanism sends an extra boost of fuel into the carburetor when you’re trying to start your saw which, in theory, will make sure it starts on just about every try. In practice, there have been quite a few complaints made by owners of this saw suggesting that this isn’t always the case. This is a gasoline powered chainsaw so you are producing some emissions that can be harmful to the environment, but this particular model is designed to minimize the impact. It is CARB compliant, which means it meets or exceeds California’s strict standards for protecting the air around us. That’s certainly a positive thing as we all want to do our part to preserve our clean air. A carrying case may not be an essential feature of a chainsaw, but it’s a nice little extra. I’m someone that likes to keep my tools organized and that’s why I think cases are so important. The carrying case for this saw is included when you purchase it. It not only makes it easier to store it away when not being used, but it also makes it easier to take it with you if you have to travel to get to a job. There are heavier chainsaws than the Wild Thing, but not too many in the consumer end of the market. This saw weighs in at about 21.5 pounds, which is quite a bit of weight to have to carry around – especially if the job is going to take you a while. You will undoubtedly feel it the next morning at the very least. With an 18-inch blade bar length this chain saw should be capable of handling most cutting jobs you have for it. It’s really meant to be used as a saw for primarily home use though, so if you’re looking for a saw for your tree cutting business this is probably not the ideal model. For tree trimming in your yard it should work just fine. There are a couple of reasons that this saw seems to have a bit of a suspect reputation that are hard to look past. First of all, it has quite a few critics that claim it’s difficult to start – this despite the super clean air filter system and the primer bulb. It’s also apparently difficult to get satisfactory help from customer service, even when the saw is still under warranty. These aren’t issues you can ignore when there are a lot of people saying the same thing. The Wild Thing is a chainsaw with a lot of potentially great features, but I would never recommend purchasing a product from a manufacturer that doesn’t understand the importance of customer service and that seems to be the case here. This item certainly has a lot of the features that you would hope to find in a chainsaw, but they won’t do you any good if they don’t work as advertised and you can’t get help fixing it when needed. They definitely need to work on improving their customer service and product reliability before I can recommend this saw.